There are many Moroccan designers, artists and craftsmen breaking new ground and leading innovations in lifestyle and creativity. Moroccan Designers Ahmed Laghrissi, Hicam El Madi and Myriam Mourabit are three exceptional practioners of their art. All were born in Morocco and have been influenced by either great family artists, their environment and Moroccan visual arts and culture. When visiting Morocco on a Pottery and Zellij Tile Design tour or on your own, one can discover galleries, souks and private spaces filled with these and many other visual artists. Morocco is a mecca of great designers ranging from Moroccan pottery to furniture to tile work, painting and lighting. 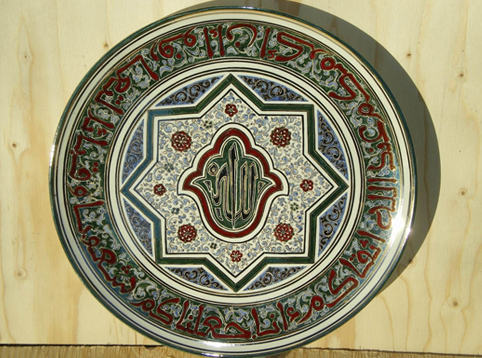 Born in 1962 his fatherand grandfather were potters in the traditonal coastal pottery centre of Safi where most Moroccan pottery is still created.The son of Laghrissi Abdelkader, a renowned artist and potter, Ahmed Laghrissi who was taught by Boujemaa Lamali a potery grandmaster in the early twentieth century. He inherited his father’s passion for the trade and is now himself a master-potter in Safi. His creations are inspired by Arab-Muslim art, and are highly individualistic whilst retaining their classic identity based on berber traditions such as Zaian and calligraphy. His researches blend old and new techniques and colours sometimes using enamel bequeathed by his father. Hicham El Madi has lived in Marrakech for a number of years , he was born in Casablanca and studied at the Institute of Appllied Arts and worked in Paris for a software design company creating designs for may different companies including Louis Vuitton. He travelled in Pakistan,Oman, Syria, Vietnam and Tunisia. hbeganto design furniture and on moving to Marrakech he worked on furnishing appartments and moved naturally into interior design. He finds his inspiration in the Moroccan craft industry. 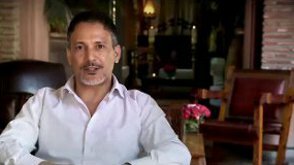 He creates from materials such as wood, molten aluminum and ceramics, to create contemporary interior decorations for riads, homes, shops, and hotels,working closely with local artisans, his creations are very popular with both Moroccan and foreign clients. She designs hand made objets d’art, that draw on the spirit and sensitivity of her cultural heritage.Her work focuses on the sensory relationship between materials and colour where the combination of nature and refined style are brought together in perfect harmony. Her exclusive designer objets appear in several shops and galleries in Morocco and abroad, her creations are stylish designs inspired by henna art and “zouak”, with close links to the traditions of Morocco’s craftsmen. She trained at the Duperré School of Applied Arts and the National School of Decorative Arts in Paris. She designs and develops commercial spaces and designs furniture for individuals using refined and high quality materials.